Webcam King George Island: View of the Airfield - A view of the airfield of King George Island, South Shetland Islands, Antarctica. GARS O'Higgins Station: Gentoo Penguins - First animal webcam from the Antarctic, 91.3 mi. 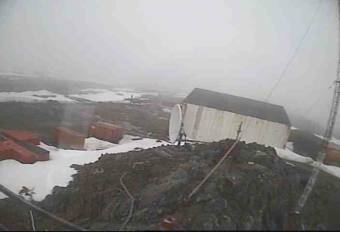 Palmer Station: View over the Station, 257.3 mi. Rothera Research Station: View over the Station, 476.2 mi. Puerto Williams: Guardiamarina Zañartu Airfield (SCGZ), 589.8 mi. Ushuaia: Changing Views, 610.3 mi. Ushuaia: Port of Ushuaia, 610.9 mi. Ushuaia: Livestream Port of Ushuaia, 611 mi. Ushuaia: Train of the End of the World, 612 mi. This webcam King George Island with the theme Airports was added on February 14, 2008 and is operated by Dirección General de Aeronática Civil. It got 40705 visitors since then. Shouldn't this webcam work or should the link be wrong please report that here. You can add this webcam here to myCams.